Red Riding Hood takes a short cut through the forest where she meets a Wolf called Wally who tries to take her basket of food. Red scares him off by singing. Wally then tries to trick Red by dressing as a ghost but Red does the same to him. Next Wally go’s to Grandma’s house and pretends to be a charity collector but Grandma isn’t fooled and tickles the Wolf with a feather duster. Wally Wolf then dresses up as Grandma to get hold of the food basket from Red but Red sees through his disguise. Finally Granny realizes that the Wolf is the victim of poor parenting and decides to foster him. This quick paced puppet pantomime with a ‘Stay Safe’ theme is introduced by a Poet Tree who speaks in rhyme. The performance also includes ‘The Three Pigs’ where Wally Wolf loses his puff and needs the audiences help to get it back. The quick paced story and the attractive comical characters keep the audience involved throughout. The show is presented from an impressive 2.7m high x 2.3m wide theatre complete with lighting and PA sound. The show is suitable for audiences of up to 200. 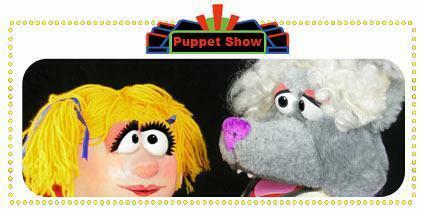 A talk & demonstration for key stage 1 and 2 on how the Puppets are made and performed can follow the performance. The production uses a 9ft high theatre booth complete with lights and P.A sound. Set up and take down time is approximately 45 minutes each side. Puss the cat helps John the miller chase off a plague of giant rats. The Rats are overrunning the entire land and eating all the grain. John has fallen in love with the beautiful Royal Princess Posy. But her father the King wants her to marry the rich nobleman Count Ergo, who has also taken over Johns land. The mysterious Count Ergo is really an evil ogre who is plotting to take over the kingdom using the plague of giant rats. When the Princess refuses to marry Ergo he kidnaps her and takes her to his castle. Puss gets into Ergo’s castle and tricks the Ogres into showing him his shape changing cabinet. When the Ogre steps inside the cabinet Puss turns it on and turns the Ogre into a mouse. The performance lasts 45 minutes with an optional demonstration showing how the Puppets are made and operated and how a play is adapted from a fairy story. The quick paced puppet pantomime features colourful hand Puppets. They are presented from an impressive 2.6m high theatre complete with lighting and sound amplification. Set up and strike time is 45 minutes each way.